Movies At Dog Farm : Movies At Dog Farm Retrospective: Friday The 13th Part II (1981) - Best Of The Friday Franchise? Movies At Dog Farm Retrospective: Friday The 13th Part II (1981) - Best Of The Friday Franchise? The original Friday The 13th (1980) scared the hell out of me when I saw it as an impressionable ten year old at the now long defunct Harrisonburg Drive-In. It's funny, now, to imagine that I was ever frightened by a Friday, but I had no idea at the time that a movie could be so . . . graphic. This was the first hard horror movie I'd ever seen, and make-up ace Tom Savini showed me things in great, gory detail that my innocent young mind had never imagined. The arrow through Kevin Bacon's neck from beneath the bunk haunted me (dammit, I knew something was under my bed), and Jason emerging from the lake at the end (". . . then he's still there. . ." - echo and fade) worked on my brain like the finest campfire tale. The next year was a formative one for me. Despite how terrified I'd been by the murders at Crystal Lake, I began to cajole my mostly obliging parents to take me to every new slasher movie that opened. That was a lot of movies - this was the height of the early 80's slasher boom, after all. I'll always be grateful for having discovered contemporary horror at such a pivotal moment in genre history. Then, seemingly out of nowhere, the TV ads began running for Friday The 13th Part II (1981). Oh, happy day! I never dared dream that the body count would continue. I'd toughened up in the interceding year, and I was ready to revisit the horror that started it all. I conned my mother into taking me to the theater on opening weekend. Lights go down, opening titles blow up, Henry Manfredini's iconic score kicks in, and we're off! 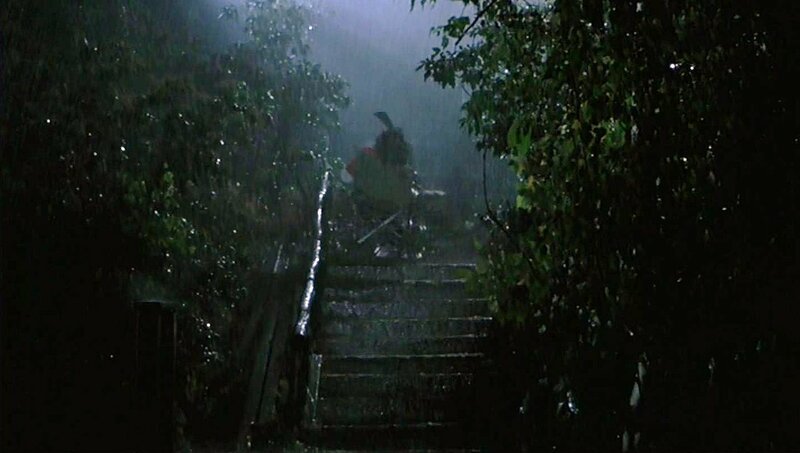 Friday The 13th Part II always seemed to me to be the scariest of the franchise. Undoubtedly, the peculiar mix of excitement and dread I carried into the theater with me gave it some added juice, but still . . . To this day, I expect to find a severed head every time I open the fridge. It always spooked me that Jason ventured out of the woods to track down and kill the only survivor of Part I, as well. Think what we now know of Jason. Premeditation has never really been his strong suit. Then he takes the boiling tea pot off the burner after killing Alice? These are the actions of a more deliberate and thoughtful slasher than we came to know later. Jason had a very specific axe to grind in Part II, and his calculating nature made him a more formidable and frightening threat. Hell, he'd even run after his victims if the circumstance dictated it. I know I'm in the minority on this point, but I always preferred Jason's The Town That Dreaded Sundown look to the now iconic hockey mask, as well. This looked like the pick-axe toting hillbilly I wouldn't want to meet in the woods at night. You just know something awful is going on under that potato sack - who wears a sack over his head otherwise? Best of all, though, Jason begins to give us a clear indication of his own moral imperatives. He wouldn't kill a guy in a wheelchair, right? 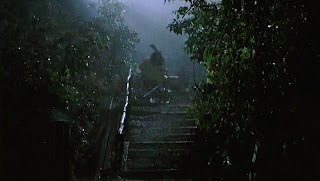 Mark's machete-in-the-face backward wheelchair ride down a lot of stairs, never tipping over until the chilling freeze frame and fade to white, proves otherwise. Jason's first two-for-one kill of copulating teens - trimmed to avoid an X rating, and very reminiscent of a murder set piece in Mario Bava's Twitch Of The Death Nerve (1971) - also betrays a very puritanical upbringing. Seriously, imagine what kind of mother Mrs. Vorhees would have been. The indication of some kind of inner life for Jason that drives his murderous impulses is way scarier than the hockey masked comic book character that came later. As slapdash as much of Part II is, it gets a lot right. Jenny's contemplation in the local bar of Jason's psychological state as dictated by the traumas he's endured humanizes him just enough to make him that much scarier. Now we know he has an agenda.
. . . and speaking of things Part II gets right: Jenny is easily the very best of the Friday Final Girls. She's likable, smart, engaging, and entirely capable of handling her own pitchfork. I remember being very disappointed that Jenny didn't at least make a pre-credit appearance in Part 3. Then I remember watching the rest of Part 3 and realizing that was only the tip of the disappointment iceberg. So was Friday The 13th Part II the best of the Friday franchise? Well, The Final Chapter competes, but I believe Part II takes the prize. Please discuss.